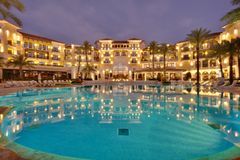 Intercontinental Mar Menor is located in the beautiful region of Murcia along the South East coast of Spain. Boasting access to an incredible six championship golf courses, all designed by the legendary Jack Nicklaus, Mar Menor is by far one Spain's leading golfing resorts. Each course provides its own unique test, so golfers of all abilities can enjoy the immaculate fairways on what promises to be a golf holiday to remember. It is not just the quality of golf facilities that make Mar Menor an excellent place to stay, but the 5-star hotel is one of finest accommodation options in the region and is just an hour from Alicante Aiport. A number of the luxurious rooms look out over the stunning Mar Menor course. Regarded as one of the country's finest all-round holiday destinations, Intercontinental has something for everyone to enjoy during your stay. Originally a Dave Thomas nine hole course, Mar Menor was transformed into an 18 hole championship test by none other than the great Jack Nicklaus and now it offers golfers travelling to Spain for their golf breaks a challenging and enjoyable test of golf not matter their ability. The lush Mediterranean landscape on which the course is built features endless numbers of palm trees, native grasses and flowering shrubs which, when combined with the ever present water and well places waste and greenside bunkers, offer a good challenge for all. La Torre, designed by the great Jack Nicklaus, is similar in style to the famous resort courses of Florida and as such players must safely negotiate vast swathes of sand and the ever present threat of water hazards lurking at the edge of the fairways and around the slick and true putting surfaces. Measuring a meagre 5,945 yards from the back tees, La Torre is playable for golfers of all abilities and while talented players and the big hitters may find it to be comparatively short, the strategy and precision required from the back tees still poses questions of any golfers skill. Set against the backdrop of the Murcian Mountains, El Valle is another of the region's courses that were conceived by the great Jack Nicklaus. Like the nearby La Torre Course, El Valle is a resort course very much in the American mould. Playing 6,739 yards from the tips, El Valle is not overly long by modern standards but subtle strategic elements will present a challenge to golfers of all abilities. Taking advantage of its desert setting, El Valle features plenty of waste bunkers as well as naturally existing rock-outcroppings and ridges, not to mention the great expanses of water that place a real emphasis on accuracy both from the tee and while approaching the greens. Measuring a manageable 6,416 yards from the back tees; Hacienda Riquelme offers a different challenge to that of the other courses found on the Nicklaus Golf Trail. Generous fairways weave their way in and around olive trees, wild flower meadows and a number of imposing and intimidating lakes. Undulating greens and outstanding bunkering add to the challengethat, thanks to a number of different tee positions, can be enjoyed by golfers of all shapes and sizes. Alhama is one of the longest golf courses to be found on the Nicklaus Golf Trail and as such can provide a serious challenge to golfers of all abilities and experience levels. Measuring a little over 7,500 yards from the tips, Alhama certainly has the length to challenge the bombers but it is not all about power around this well conceived layout. Noticeable changes in elevation can make club selection tricky while small greens, water hazards and sneakily positioned bunkers place an emphasis on accuracy and shot-making; two trademarks that The Golden Bear was well known for in his playing days. Measuring 6,498 yards from the back tees, Saurines de la Torre is not overly long by modern standards but long enough to challenge the longer hitters. This spectacular desert course features perfectly manicured fairways that weave their way between sand dunes but interestingly that is where the sand on the course stops. There are no bunkers to speak of but the giant 6 acre lake that runs along the length of the 18th hole means concentration is required from start to finish in order to score well around here. Situated close to the charming village of Torre Pacheco, the Intercontinental Mar Menor 5* Golf and Spa Resort opened in 2006, and has since received many plaudits for its superb quality. The first class hotel offers a total of 64 rooms and suites which are beautifully designed and decorated, ensuring the best in luxury. With panoramic views over the Dave Thomas designed golf course, the rooms are spectacular, and inside feature luxury fittings such as hydrotherapy baths, LCD plasma screen televisions and high-speed internet access. Every demand is well-catered for at Mar Menor, where you will find all that you could ask for as you enjoy the legendary sunny climate in this fantastic corner of Spain. The exclusive spa complex is a haven of relaxation, where you will find mood music and a fascinating array of signature treatments, all endorsed by the fantastic ESPA product range. Holistic therapies, state-of-the-art fitness suites, a zen studio, relaxation areas, heat experiences, hydrotherapy, vitality pools and a swimming pool combine to offer a sublime spa experience. Hot stone massage and intensive facials are among the signature treatments. During your stay at Mar Menor, be sure to sample the enticing Murcian and Mediterranean cuisine in the stylish restaurant. The Pool Bar and Grill is a charming place for a refreshing beer or a light snack. We enjoyed the golf. Some challenging holes. Excellent round with some interesting holes, highly recommended. Complicated set up with paying and collecting buggies. We requested 4buggies and only had 2 delivered. The course is long due to the travelling from green to tee More sign posts required as tees hidden and difficult to find when you leave the greens. Slow service in Club house and not as friendly as other places we visited. The views of the course and the surroundings are beautiful, however no distant landscapes, beach or sea, due to being surrounded by buildings, mainly well kept buildings, so not too sore on the eyes. The holes are quite level, but are made relatively challenging by the shear quantity of bunkers everywhere. Great overall though, thinking of booking up again soon. slow round fully packed with some people on the course who could not play golf,nearly 5 and three quarter hour round. Course was busy but moved steadily.